Ruggedly built 6 and 2 meter transmitter. On 6 meters, it provides up to 120 watts AM input and 140 watts CW input (slightly less on 2 meters). Circuit has two built-in power supplies, five RF stages, two dual-triode audio stages and two 6146's in the final amplifier. From every angle . . . quality, performance and dependability. A spotting switch is provided for "zero-beating" an incoming signal and allows tuning of the transmitter before switching on the final amplifier. An auxiliary socket provides for receiver muting, remote operation of an antenna relay and remote voice control of the transmitter. Estimating the value of a rig can be challenging. 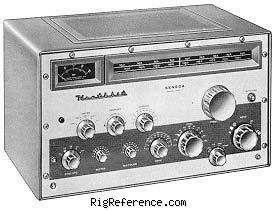 We collect prices paid by real hams over the years to help you estimate the current value of the Heathkit VHF-1 'Seneca'. Just bought or sold this model? Let us know what you traded it for and help other ham operators!